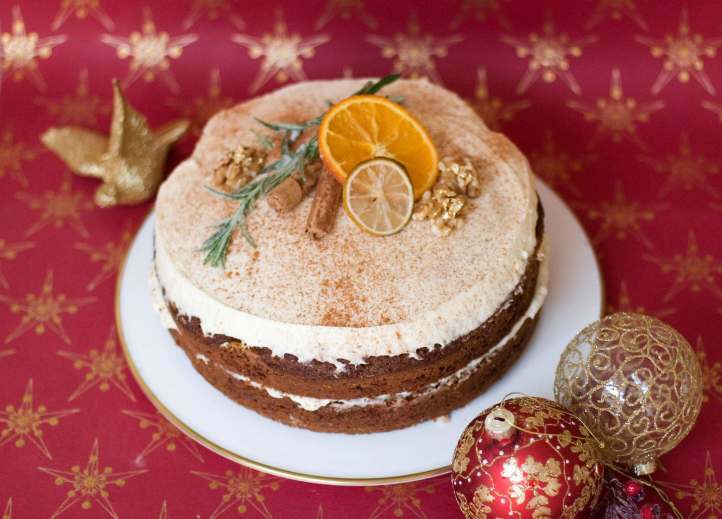 Summary: Why not break from tradition with our zesty, spiced carrot cake? Preheat the oven to 170 C. Oil and line both the base and sides of a 20 cm deep round tin with baking parchment. Tip the sugar into a large mixing bowl, pour in the sunflower oil and the beaten eggs. Lightly mix with a wooden spoon. Stir in the grated carrots, walnuts, orange and lemon zest. Mix in the flour, bicarbonate of soda and spices, then sift into the bowl. Lightly mix all the ingredients together. The mixture should be fairly soft and runny. Pour the mixture into the prepared tin and bake for 40/45 minutes, until it feels springy when you press the centre. Allow to cool in the tin for at least 5 minutes, then turn out. Peel off the paper and cool on a wire rack. In an electric food mixer, whisk the butter, orange juice and zest together while adding the sieved icing sugar slowly. Continue to whisk until the buttercream is light, fluffy and pale in colour. A dash of hot water can be added while mixing if the mixer is struggling! When the cake is cooled completely, use a straight sided knife or pallet knife to smooth the buttercream on to the top of the cake. Start with a large dollop of buttercream in the middle, then work it gently out towards the edges until the top is covered. Decorate with dried sliced citrus fruit and cinnamon sticks and a dusting of ground mixed spice.